Gorbals library, the first public lending library in Glasgow, started life in 1901. The etymology is uncertain; some claim the name Gorbals has its roots in Latin, others Gaelic, and there are several translations reaching back to medieval times, but the one I favour is ‘a garden of the town’. This former leper colony was never a garden, of course, not the kind associated with magnolias and camellias; historically, the Gorbals held occupancy in the popular imagination as a dark, terrifying place, home to thieves and cutthroats, and perhaps it was, but it was also a vibrant immigrant city within a city. It was home to those forced from their native land by the Famine or the Clearances and to the dispossessed born into servitude and debt peonage, it was home to persecuted populations subjected to violent expulsions by barbaric regimes and rapacious landowners – both foreign and domestic – and it was home, even the adopted home, to some remarkable individuals who stood as ‘accusers of capitalism dripping with blood from head to foot’ – people who were imprisoned and brutalised over campaigns for social change and a life worth living. Perhaps it was after all a garden once, a place where things nourished will grow; it is the name I prefer because the library was exactly that to me. I crossed the suspension bridge over the Clyde to the library after school in Ropework lane almost every day. I loved the fact you could bounce the bridge a little, (the impossible hope was to make it sway), and I loved it because it was a bridge to another world. Through the years I progressed to Stirling’s library, not at all far from that bridge, where I delved into weightier tomes, and where I did my best to draw the attention of the young woman who stamped the return dates on my books most evenings. She never looked up, and then one day she did. Harry Young was born in the same year as Gorbals library, but it was outside Stirling’s library that circumstances brought me to meet him. Had I not known one, I would not have known the other and would not have known him. In the mid-1970s, before coffee and couture culture dominated the area around (the now former) Stirling’s library, it was not unusual to find someone standing on a box plunked down on the pavement outside the old reading rooms, trying through raised voice to raise the consciousness of passing crowds. They hoped to spur intellectual self-development and muster up revolutionary ideas among the working class, and had this effort been applied to a profit-making venture they might have been rich, but as it was they were lucky if they sold a few skimpy newspapers or reduced their bundle of flyers by a fraction. But some stopped and listened, and one day, stepping out of the library into the cold grey air, I did the same. The voice on a box advocated with sincerity non-violent conversion through majority vote to a socialist paradise, and something in all that got my attention, as perhaps it would any peacenik teenager of the time. Time passed with the talker punctuated by palms and fists about ists – Leninists, vanguardists, reformists and pessimists. The gist I got, and before leaving I accepted an invite by way of a flyer to the McLellan Galleries in Sauchiehall Street – a gig spot for local bands and dreary causes – to hear a keynote speaker called Harry Young talk about the prospect of paradise on planet earth. He was the longest serving member in one of the oldest parties, and whilst my interest was piqued by the thought of earthly splendour in an idyllic state with free String Band albums, I don’t think I had any serious intention of showing up; I had read the The Grapes of Wrath (twice), but truth be told I was more attracted to Buddhism at the time. The flyer remained in the pocket of my well-worn brown velvet jacket for a week, and by the time it once more saw the light of day it had all the appearance of an ancient document. Unplanned, I gently smoothed it out on the counter at Stirling’s Library just after Zola was date-stamped by the young woman that never looked up. Interested in going to this? To my complete surprise, she said yes and we did. We met on the stone steps to the Library between the neoclassical columns and within half an hour were at Harry’s venue, on time and too early. During our walk, albeit a bit brisk and breathless, we exchanged facts about ourselves, and it must have gone well because several times we laughed as though we actually knew each other. An old guy on the grog the double of Spencer Tracey clownishly barred our way up Hope Street asking for spare change, and after pocketing the money gripped our forearms as though he was going to marry us, then emphatically declared how perfect we were as a couple – he even made me promise I’d look after her. After we escaped he called after us in a loud, gravelly voice, causing other heads to turn, ‘Hey! You look beautiful, hen, by the way!’ She did, too – I wonder if I told her? We took a seat in the front row and waited. Fearful of the sudden silence, I scanned the area and suggested we wander over to the bookstall at the back of the hall. Literature was spread out and we flicked through books that, judging by the covers, might have been about bearded fraternities. The bearded vendors and their bearded mates were engaged in one big huge conversation punctuated by brash bursts of laughter, and their inexplicable joy made me feel intimidated. I began to worry about what the maverick version of me had landed us in. 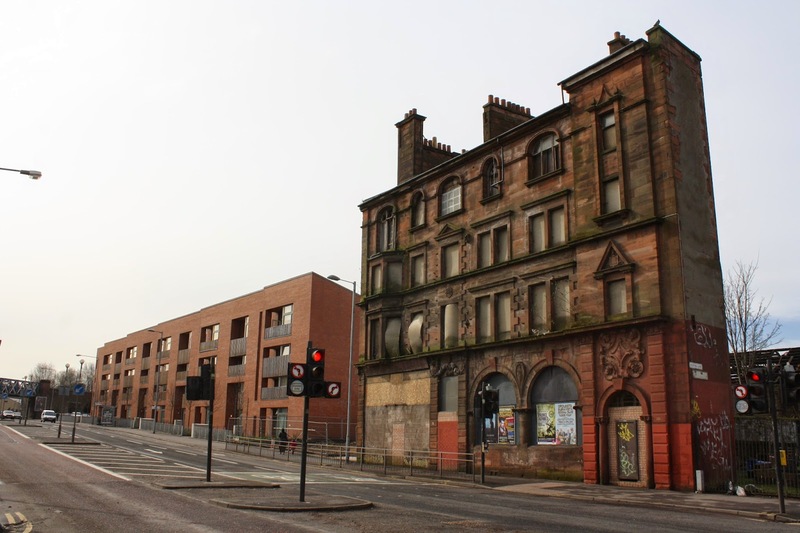 There were any number of venues I might have suggested – a pub with a band, like The Kind Man on Pollokshaws Road, was just one of the many ideas translated as missed opportunities that came crashing in. Instead, I had brought her to a place where people had very particular notions about what it means to get in the party mood. Then Harry appeared. Harry spoke spiritedly and engagingly about life as lived within a rigged system punctuated by starvation, wars, and routinised death, and spoke unrelentingly about why we should be socialists, giving compelling cause for hope, optimism, and action. He captivated the small audience by way of an account of the progression of his life across continents and epochs, and the people he met at socialist world congresses, including Lenin, Trotsky, Bukharin and Stalin – though Bukharin was the only one that, given a choice, he would have preferred to join him for a pint. It was perhaps nonsense coming from my side of the conversation, but Harry had a way about him that led me to forget my self-doubts, and I put my questions. I knew then, just as he must have known as a young man sitting at a conference table in those heady revolutionary days, this was a moment. Would the rich allow any threat to their interests? (I was thinking of a teacher I had at school just two years earlier when I asked this question; he promised fair treatment if I owned up to a misdemeanour, then thrashed me thoroughly). True, socialist campaigners such as Rosa Luxemburg were murdered, Harry replied, and we might therefore consider force as the answer; but capitalism is armed to the teeth and insurrection would be flattened. Besides, the use of force must be maintained, or the threat of it, just as it is under the system of capitalism, and how could a truly representative socialist state be built on those sorts of foundations? Only a vote by a massive majority will demonstrate the desire for the overthrow of capitalism, and in so doing will negate the need for violence. Quoting Gramsci, Harry insisted we should not allow the enemy to define the space within which we solve problems. I wrote down those words and have them still. Today as a teacher of psychology, and equally as a student of psychology, the words have even greater resonance; the enemy, after all, is in part our fixed mindset, and we cannot change that if we accept illusory boundaries. This was 1974, a period of deepening crisis, and the turning point for global capital; a road that would, by necessity, lead us to Thatcher and Blair and Trump and the whole bloody mess that we have today. People like Harry saw it coming. But it was also a period of power cuts, and it was with some irony, therefore, that Harry bade us farewell with the slogan of the soixante-huitards, ‘All power to the imagination’ – a détournement of the ‘situationists’, and for me the most inspirational and liberating words of any political uprising. We really ought to paint it everywhere. After Harry’s talk, we navigated our way through the crowds to the Lido café. Saturday night discos were feverishly popular at that time. They were magnets for party people with dress codes that included wide collars, clingy trousers, shiny materials, dangly things, and dangerous footwear – akin to walking in mini oil-rig platforms. They passed purposefully in pairs through city streets, gleeful and exultant, to boogie wonderland. As we walked we talked about Harry’s hopes, and maybe we looked miserable amidst the Glasgow glitterati, but I remember being filled with dreams about the future and the certainty of lasting change. On the white stone edge encircling the George Square flowerbeds, we waited on the night bus, and when it arrived we found reasons to wait for the next. But at some point the situation flipped; through a clearing in the mist of our dreamy conversation I saw trouble staggering our way, two devotees of violence, each carrying a quarter bottle of whisky and already quite drunk – and trouble saw piñatas. They introduced me to their Doc Martens. True to the findings of numerous field studies on bystander behaviour, people passed or moved away, then two Samaritans sitting on a nearby bench came to our rescue; their involvement should have led more to follow, but no one did. Nonetheless, we thought it was over when the heavyweights – finding themselves up against equals – backed off, but they returned armed with a crate-load of bottles and began throwing them wildly across the Square. Glass scattered in all directions, threatening crowds waiting on buses, and people screamed, some ran hysterically into the main road. Even the Samaritans left the scene. The girl from the library got a black eye, and I had cuts and bruises – one of the men took a grip of my hair and thumped my head repeatedly off the ground. Within a few weeks the injuries were hardly visible, but some wounds never healed. After I saw her home we never again met. She heard pebbles pinging against her window, but her answer was to close the curtains – or perhaps that was her mother. In any case, to be truthful I didn’t try so hard. In the heat of the violent episode I lost the girl from the library, and when things cooled I realised I had also lost all sense of Harry’s aspirations. Within the confines of my experience, and the dichotomous mindset so typical of youth, the people of George Square – thugs and bystanders – became the working class in their entirety, and I hated them. Stalin in all his brutality might possibly have had more appeal – after all, didn’t he say a revolution could not be made with silk gloves? The episode appears now as a test of faith; today I understand more about poverty, violence, class, and group behaviour. And yet, I often find myself returning to change the events of that night. I felt responsible, but also shame, and against all reason, I still do. Years later, whilst visiting my lovely sister and her many children among the densely packed council houses of Ardrossan, I was lured into a mobile library by the offer of cheap books withdrawn from stock – ironically, one of the withdrawn was on overcoming shyness. André Gorz caught my eye, and I slid fifty pence across the counter. I hadn’t expected to see her. She turned Gorz and glanced at the title for a moment – Farewell to the working class – then she glanced at me. That ending brought a wee tear to my eye. Great writing. Is this chapter 1 of The Girl in the Library? I recall hearing Harry Young speak at the Maclellan Galleries – maybe the same night, but without suffering such dire consequences. Years later, in the midst of the Gorbachev era, I crossed Siberia with him. Even in encounters with doctrinaire true believers of various types, Harry was courteous, and he had also kept what we might call a gift-o-the-gab in Russian with which he charmed train attendants. I was recalling him recently when a card he’d given me with his London number turned up.